LOS ANGELES, CA (October 25, 2013) – America’s kids are still being lured to drink by seductive alcohol ads in larger metropolitan areas on public transit. This was a finding in a new survey released today by Alcohol Justice at a press conference in Los Angeles and available at www.AlcoholJustice.org. The report looks at the alcohol advertising policies and contracts of 32 metropolitan transit agencies and cities, including L.A. and Boston where advocates are making progress in fighting alcohol ads. Actor Kurtwood Smith hosted the press conference on the steps of Los Angeles City Hall where Councilmember Paul Koretz is championing a proposed ordinance banning alcohol ads on city property. The report, “These Bus Ads Don’t Stop For Children: Alcohol Advertising on Public Transit,” found that 18 of 32 agencies clearly prohibit alcohol ads, while 9 of the 14 remaining agencies have partial limits on alcohol ads. Some of the biggest cities like Los Angeles, Chicago, Atlanta, Dallas and New York still allow alcohol ads. Apparently outcry from parents and child advocates is not being heard over the buzz of advertising firms and alcohol corporations promising ad revenue. The report finds that the economic justifications at the transit agencies do not stand up to scrutiny, as only .03% to .10 percent of operating revenue is from alcohol ads and only 3% to 10% of ad revenue is from alcohol ads. 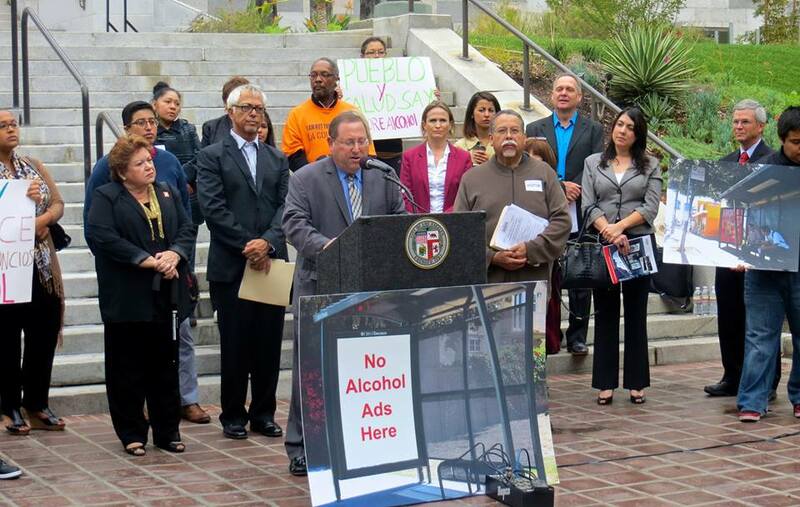 The press conference brought together the Los Angeles-based coalition NoAlcoholAds.org and Los Angeles City Councilmember Paul Koretz (5th District), who has taken over for former council member Richard Alarcon in guiding an ordinance through city hall that would extend an existing bus bench alcohol ad ban to other LA Metropolitan Transportation Agency property like bus shelters and street furniture. According to the new report, advertising on transit vehicles and transit stations comprised 17% of the out- of-home market in the U.S. in 2012. Street furniture such as bus benches and bus shelters is also considered transit advertising. Whether this type of alcohol advertising will continue to grow, or be eliminated is an ongoing public policy debate. U.S. trade associations like DISCUS, Beer Institute and Wine Institute, along with the major producer corporations like, Diageo, Anheuser-Busch InBev and CBS Outdoor, push all levels of government for profits at public expense with self-regulatory guidelines, fighting new restrictions and loosening existing bans on alcohol advertising. Los Angeles as well as Boston exemplify city alcohol advertising policies that are in direct contrast with their Transit Agency bans on alcohol advertising leading to jurisdictional conflicts and legal challenges. MA state law however, allows alcohol ads on city and state property, which includes bus benches, bus shelters and other street furniture. “Moving forward, SAFE-MA will continue to educate local legislators and communities about the proposed state law to ban alcohol ads on all state property and urge legislators to make the health of MA youth the highest priority,” Parsons added. The report concludes that the strongest approach to achieving the goal of banning alcohol ads lies with changing government policy through new ordinances and laws. While the cost of alcohol harm greatly exceeds tobacco cost, there is already a national policy, “The Master Settlement Agreement,” mandating that tobacco companies not conduct any outdoor advertising, including on public transportation. Alcohol Justice is working to create a similar policy for alcohol advertising in the U.S.
To read the complete report, “These Bus Ads Don’t Stop For Children: Alcohol Advertising on Public Transit,” please visit AlcoholJustice.org.